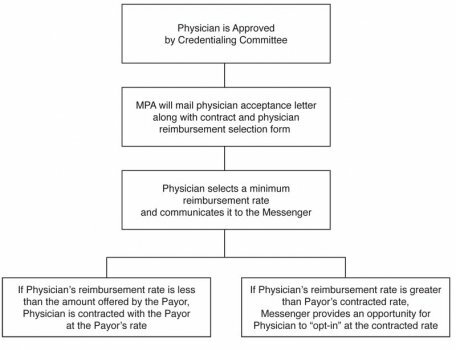 In a “messenger model,” the organization acts as a neutral “messenger” between managed care payors and physician providers. The messenger conveys information on fees and terms that a physician is willing to accept. Each physician is an independent agent, and chooses terms on an individual basis – the messenger process is not a joint negotiation of fees. The messenger (organization) provides objective information about a payor’s contract offer, such as comparison data and definition of terms. The messenger makes no recommendation, and physicians in the network are prohibited from communicating recommendations to each other. The messenger never participates, inspires, leads, recommends or influences acceptance, refusal or modification of terms. The primary advantage of a messenger model is a single-point communications conduit for providers and payors. By aligning with MPA, our physician providers benefit from Methodist’s standing in the community and reputation for quality health care. By working with MPA, payors are able to communicate with more than 1,000 physicians through a single, familiar conduit.